The swearing-in of Chief Victor Umeh on Thursday as the Senator representing Anambra Central Senatorial District yesterday threw his constituents into jubilation. 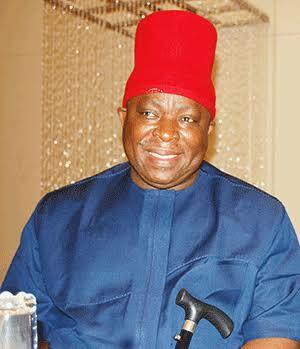 Jubilation broke at about midday, after Umeh was sworn in at 11am. As soon as the news of the swearing-in filtered into Awka the state capital city, members of his constituency, the All Progressives Grand Alliance (APGA) faithful, and Umeh’s well wishers went into jubilation. Chief Nnaemeka Orji, a stalwart of APGA in Idemili South local government said last Saturday’s election and Umeh’s swearing in was the handwork of God. He said, “It is the hand of God working for his people; we in Anambra Central have been without any senator representing us thereby losing our entitlements at the federal level and some people who claim to love the zone were comfortable with it. For Chief Dan Ogbuefi, Umeh’s swearing-in has brought peace to the zone, just as it has put a stop to unnecessary and unending litigations. He said, “We have suffered for two years, do you know what that means? The empowerment that would have come to our people, the employments, at least personal staff and other favours that would have come our way, all these are what we have been suffering.